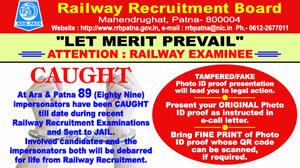 Welcome to the web-site of Railway Recruitment Board, Patna. This web-site has been established to serve the requirements of applicants and to facilitate easy download of notices and application forms. The web-site will also publish the results of various examinations for different posts from time to time. Information: Use this link for Online Registration and Filling-up of Application for Level 1 posts. Indicative Notice: Regarding starting of Online Registration under RRC-01/2019 from 12-03-2019. RRC-01/2019: Centralized Employment Notice for posts of Level 1 in 7th CPC Pay Matrix. Information: Online Application for Ministerial & Isolated Categories Posts to start from 8th March, 2019. Info: Online Registration for Para Medical categories starts from 4th March, 2019. Corrigendum: Amendments made to CEN 01/2019 for recruitment to various NTPC Graduate and Undergraduate Posts. Information: Online Registration for Non-Technical Popular Categories (NTPC). Notice: Use this link to Specify Your Choice of Examination Language. Information: Use this link to Know the Status of your Application submitted under CEN 03/2018. Notice: On Choice of Exam Groups while making Online Application. Notice: Updated news on Vacancies available under CEN 03/2018. Important Notice: Use this link to Update/Correct your Bank Account details. Cut-off Marks: Normalized cut-off marks of candidates short-listed for PET. Results: List of short-listed candidates for PET for Level 1 Posts. Important Notice: Regarding result of short-listed candidates for PET for Level 1 Posts. Shortlisted candidates, Score Card, Exam City & Travel Pass for Computer Based Aptitude Test. Normalization of Marks in 2nd Stage CBT: A Scientific & Statistical Process. Results: Candidates shortlisted for Computer based Aptitude Test. Info: Normalized cut-off marks of 2nd Stage CBT for the posts of Assistant Loco Pilot against CEN 01/2018. Raising of Objections on Questions/Options of CBT for 2nd Stage ALP & Technicians. Notice: Result of 1st Stage CBT & Exam Date for 2nd Stage CBT. Revised List of Candidates qualified for 2nd Stage CBT. Click here for the Exam Trade Syllabus. F.A.Q. on common questions for 2nd Stage of CBT. Helpdesk for Queries related to 1st Stage of CBT. 15-Apr-2019: CEN-03/2019 - (Ministerial & Isolated Category Posts) - CANCELLATION OF VACANCIES. Railway Recruitment Board calls for application from eligible candidates through Employment News (A publication of the Government of India). The employment notification is also published on the Internet web site. The applications are scrutinized for eligibility. The eligible candidates are called for a written examination with call letters being sent a month in advance of the date of the examination. In most of the categories of jobs, there is no interview after the written examination. In some categories, there will be a second stage written examination. In categories related to operational safety, there will be a psychological test. The application-details furnished by successful candidates are verified and they are called for counselling and scrutiny of original documents. A panel of names is then recommended to competent authorities to the extent of vacancies. The candidates will be required to pass a medical examination before appointment. The results of selection at every stage will be made available on the Notice Board of RRB/Patna in Results through the Internet website to the successful candidates through post. The selection process is based on merit and is subject to the rules and regulations issued by the Ministry of Railways (Railway Board), Government of India which includes reservation of jobs for certain castes/communities such as Scheduled Castes (SC), Scheduled Tribes (ST), Other Backward Communities (OBC), etc. Ex-servicemen are also entitled for reservation as per the rules. The entire computerized recruitment system functions impersonally without fear or favour. There is no scope for corruption, influence or discretion in this process. Candidates indulging in malpractices and unfair means are dealt with strictly. The overall policy guidelines for all Railway Recruitment Boards in India are laid down by Railway Recruitment Control Board, New Delhi. All eligible candidates desiring to apply for the posts of Railway Recruitment Boards are requested to have Aadhaar Card available with them as it will be needed to establish their identity in future vacancies.